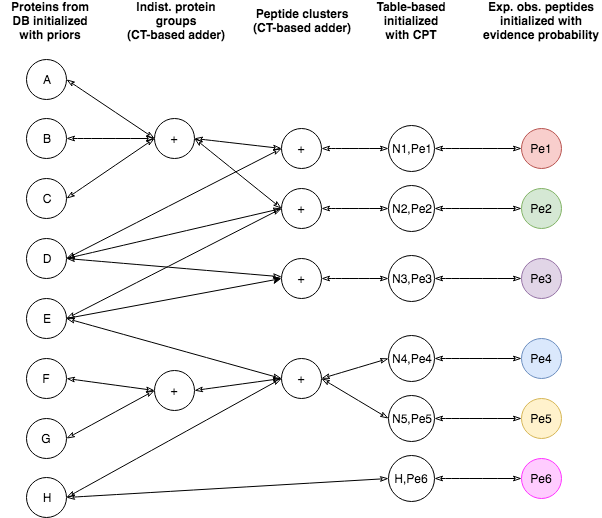 Fido is used with the main parameters alpha (pep_emission), beta (pep_spurious_emission) and gamma (prot_prior). and concatenation of PSMs) when given more than one. This is useful for fractions or replicates. It assumes one search engine run per input file but might work on more with undefined behaviour. which is helpful for reducing false positive identifications in the presence of many shared peptides between present and non-present proteins. max-product inference (for this, set the regularize flag and choose a p-norm smaller than 0 [implying infinity]). You can give it any name (e.g. OpenMS EPIFANY Update Site). 4) You will then find EPIFANY (together with the other OpenMS nodes) in the node repository in the lower left of the program. 5) You can create a new workflow with it or import the workflow for our example data. Don’t forget to configure Input File(s) to point to the files on your computer. Command line documentation can be found here in the UTILS section of the OpenMS documentation under the tool’s name. Contradicting connected components may dictate runtime in certain parameter settings. Extensive parameter grid search is computationally expensive (may be reduced if there are good estimates). General input for a complete protein inference workflow: Centroided mzMLs from a bottom-up/shotgun data-dependent acquisition experiment. If your data is in “.raw” format you can do the conversion and centroiding with e.g. proteo-wizard (included in every OpenMS installation, too). Inputs can be replicates and/or fractions. Depending on your goals you could also merge conditions. We advise to calculate peptide probabilities on a global (i.e. merged) level, as done in the example workflow. Example Data: You can use the converted mzMLs on our server as direct input to the KNIME workflow that is also linked there. The data comes from the iPRG2016 study (sample “B”). You can also use the idXML on the server for a direct input to EPIFANY.